This Medicine Buddha with Wu Luo pendant features a wu luo and a blue medicine Buddha with a lot of crystals surrounded. The Medicine Buddha protects one from illness, disease, misfortunes, and bad fortune; the wu luo is a powerful symbol for good fortune and protection from obstacles, hindrances, and bad luck. It is believed that having the image of medicine Buddha in a room, home, or office can cure all kinds of diseases and help people overcome disasters. Also known as the bottle gourd, the wo lou is known to promote good health, prosperity, and good blessings. The unique shape of the wo lou is said to represent the unity of the heavens and earth: promoting one's connection to one’s inner spirit. The wo lou is said to enhance one’s feng shui and increase positive chi in an environment and family. 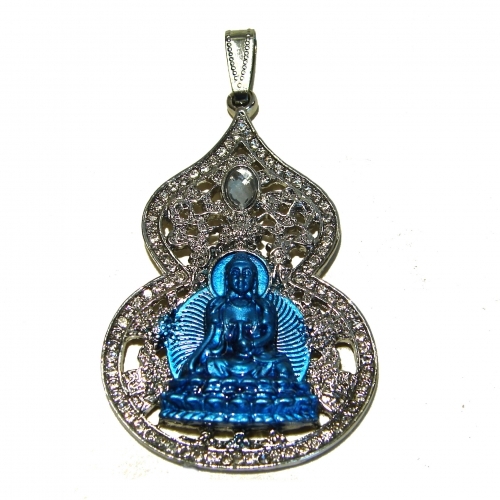 The dimension of the Blue Medicine Buddha pendant is approx. 2" x 1.375" x 0.125". It is made of alloy.